Latvian airline airBaltic today, on March 31, 2019, launched scheduled flights between Riga and Dublin, Ireland. Now airBaltic flies with the most modern commercial aircraft Airbus A220-300 aircraft to Dublin four times a week, with ticket prices starting at EUR 39. Martin Gauss, Chief Executive Officer of airBaltic: "We are happy to start our summer season schedule by launching a long-awaited and highly demanded connection between Riga and Dublin. Now travelers between the two cities will have a great flying experience with very attractive prices in economy or our full service business class on the new Airbus A220-300 aircraft." Irish Ambassador Jim Hennessy congratulated Martin Gauss and airBaltic on this breakthrough and looked forward to further traffic in both directions. Traveling on the Riga–Dublin route, passengers are able to add a fresh meal to their booking starting from 7 euro. In addition, when booking with airBaltic, passengers always receive free hand luggage and a personal item allowance that can be carried onboard. Passengers can also now purchase a new service – additional weight of four kilograms for their free cabin baggage allowance for a price starting at 8.99 euro. By using this service, the total cabin bag allowance can reach a total weight of up to 12 kilograms. A complete schedule of airBaltic flights and tickets for the new destination are already available on the company's homepage at www.airbaltic.com. airBaltic serves over 70 destinations from Riga, Tallinn and Vilnius, offering the largest variety of destinations and convenient connections via Riga to its network spanning Europe, Scandinavia, the CIS and the Middle East. In summer 2019, airBaltic will introduce new destinations from Riga to Dublin, Stuttgart and Lviv as well as Kos and Menorca. airBaltic (AIR BALTIC CORPORATION) is the most punctual airline in Europe connecting the Baltic region with over 70 destinations in Europe, the Middle East, and the CIS. airBaltic is a joint stock company that was established in 1995. 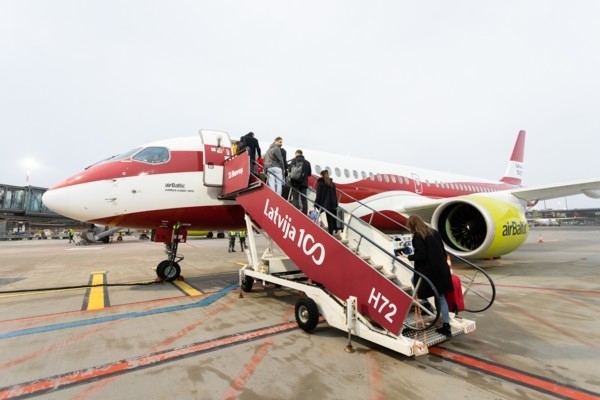 Its primary shareholder is the Latvian state, which holds 80.05% of the stock, while Lars Thuesen holds around 20% through his fully-owned Aircraft Leasing 1 SIA. The airBaltic fleet consists of 36 aircraft – 16 Airbus A220-300s, 8 Boeing 737s and 12 Bombardier Q400Next Gen aircraft. airBaltic has received numerous international awards for excellence and innovative services. In 2017, the airline received the CAPA Regional Airline of the Year award, while in 2018 and 2019 airBaltic received the ATW Airline Industry Achievement Award as the Market Leader of the Year. airBaltic achieved the best on-time performance globally in 2014, 2015, 2016, 2017.